Treating pets with allergies can be a frustrating, time-consuming, financially draining prospect. There is no one treatment; there is no cure. Our goal in treating allergies is to keep patients comfortable using the most affordable, minimally time consuming treatment that will be the most effective in keeping itching to a tolerable level for both the patient and their people with a minimum of side effects to the patient. This usually involves employing several strategies at once to attack the allergies from different angles. Here are some suggestions for things you can do at home and treatments to ask your vet about. Staying inside will help those pets that are allergic to outside pollens. This reduces house dust and the house dust mites that invade all of our homes. Many dogs are allergic to storage mites found in grain products. Buying smaller bags of food will reduce the numbers of storage mites that can reproduce in your pet’s food (which your pet inhales while eating). Your veterinarian may even recommend a strictly canned diet. Shampooing, cool water rinsing, wiping of the face and paws physically removes dust, dust mites and pollens from your pet’s coat, reducing the amount of allergens inhaled. Some Shampoos also help reduce the numbers of bacteria and yeast that build-up on inflamed, allergic skin. Your veterinarian will help you choose the best shampoo and conditioner for your pet’s current skin conditions. As your pet’s skin conditions change, so might your vet’s shampoo recommendations. Conditioning rinses can provide prolonged anti-inflammatory relief and anti-itch effects. Wiping your pet’s face once daily, at night, before bed, can also help reduce inhaled pollens and dust. Having your pet walk through a foot bath, then drying his feet, especially between the pads, can be beneficial as well. Your vet may recommend a special foot bath for this purpose. Truly Anallergenic foods contain nothing that the body can recognize as a foreign material. The proteins have been formulated to be so small that they are unrecognizable as foreign material, so the body can not react in an allergic manner to them, yet they are nutritious for the pet. Only your veterinarian can prescribe truly “Anallergenic” food for your pet. This may be very beneficial if there is suspicion that your pet is allergic to some component in his food (chicken, beef, wheat, soy, other proteins, preservatives, etc). Pets going on an Anallergenic Food Trial must remain on that food, and ONLY that food, for 3 months (nothing else can pass their lips unless specifically approved by your veterinarian—any little “cheat” defeats 3 weeks of prescription food benefits). If the allergies are improved, your vet may recommend switching to a “Hypoallergenic or Limited Ingredient Diet”. Pets with severe food allergies may need to stay on Anallergenic food long term to keep their skin comfortable! It has recently been discovered that animals, like many people, are genetically predisposed to allergies because of less than ideal skin barrier functions. Topical fatty acid and ceramide treatments are now being used to re-establish a more normal protective lipid layer on the skin. This, in turn , reduces the skin’s sensitivity to allergens in the environment and to histamines released in the body during allergy attacks. Proanthozone is an anti-free radical product containing bioflavanol grape seed extract. Proanthozone is a very powerful antioxidant that scavenges free radicals while inhibiting enzymes that break down collagen. Proanthozone is helpful for the immune system, liver/kidney function, allergies and cardiovascular health. inflammatory effects of high potency omega 3 fatty acids given every day of their lives. (They will also be receiving beneficial effects to their joints, liver and heart!). products without consulting your veterinarian as you may be spending a lot of money and still not giving a high enough dose, or giving too many PRO –inflammatory fatty acids, defeating the whole allergy treatment purpose. There are several classes of antihistamines available for use in dogs. Just as one antihistamine may work well in one human and not in another, dogs have individual responses to antihistamines as well. 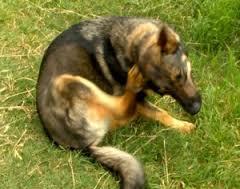 Dogs also require different doses of antihistamines than humans to control itchy skin conditions. They need to be treated at these doses for a minimum of 5 days, in most cases, to evaluate the effect of the antihistamine as it takes that long to get an effective blood level of antihistamine in a dog. Giving antihistamines periodically, intermittently or at inappropriate doses is rarely helpful. Your veterinarian can suggest antihistamines and doses to try. Please consult your vet before changing medications or dosages to ensure that you are treating appropriately. effective in food allergic pets. Short courses of steroids, either by injection or oral treatment, may be necessary to prevent a pet from injuring itself due to excessive licking and scratching. However, steroids have life draining side effects and should not be given long term unless no other alternative is possible. Atopica is an alternative to steroids that is used to suppress the overactive immune system pf the allergic pet It has fewer side effects than steroids. This medication can be given long term, sometimes every other day or only a couple times a week. This is a good treatment option when the above treatments aren’t working well enough to keep a pet comfortable. Apoquel is a revolutionary new treatment for allergies in pets, just released in January 2014. (Temporarily on limited supply due to veterinarian’s enthusiasm and buying all of the initial manufactured stock !) It inhibits a newly discovered enzyme system (JAK) at the cellular level that is required to cause allergic reactions. It is reported to be very successful in clinical trials. There are minimal long term side effects, compared to steroids and is going to be less expensive than Atopica, with a less dramatic impact on the immune system! “Allergy Injections” can be formulated specifically for your pet, based on exactly what he or she is allergic to, according to blood or skin testing. Your veterinarian can perform the blood testing. A Board Certified Dermatologist needs to perform skin testing in order to formulate allergy injections that way. These injections can be very helpful for patients who must have daily oral medication to live comfortably or who are not comfortable even with daily medication and special foods. In some cases, when daily treatments are still needed, pets often get along comfortably with fewer medications or only dietary control, avoiding the cost and detrimental effects of long term more expensive medications. If you are frustrated with your pet’s response to treatment, if your pet is not comfortable despite following your veterinarian’s recommendations, or if you are just “done” with all of the special care, please ask us about Immunotherapy. It may be time! Contact your vet if your pet is excessively itchy/ scratching/ biting / shaking or itching ears– he may have allergies (or infection!). Take this blog with you so you can ask your vet what treatment options would be best for your pet!